Mereo BioPharma has had a successful end of Phase II meeting with the US FDA, in which the outline for a pivotal Phase III clinical trial programme for acumapimod for the treatment of acute exacerbations of COPD (AECOPD) was agreed in principle. The Phase III programme will consist of two randomised, double-blind, placebo controlled studies, in which patients will receive either acumapimod with standard of care (SOC) or placebo with SOC. It is estimated that each trial will enrol c800 patients. The primary endpoint of the trial will be time to next severe exacerbation/rate of severe exacerbations, with secondary endpoints including reduction in systemic corticosteroid exposure, all cause hospitalisation, symptoms measured by St Georges Health Questionnaire, as well as safety and tolerability. Patients will have the option for re-treatment of severe exacerbations at any point after the first 14 days following initial dosing, and will have a 12-month follow-up period. Acumapimod is a small molecule inhibitor of p38 MAP kinase, in-licensed from Novartis. In the 282-patient Phase IIb trial with two undisclosed doses of acumapimod and placebo, there was a significant reduction of more than 50% in clinical treatment failures (as defined by the number of re-hospitalisations for treatment of COPD) at days 90 through 150 in patients treated with the high dose of acumapimod compared to the low dose or placebo (p≤0.027 to 0.05, for further details see our Outlook note from January 2019). Mereo BioPharma will continue to work on finalising the Phase III trial design and at the same time look to out-license acumapimod, so that it can focus its resources on on becoming a rare disease, specialty pharmaceutical company. Trinity Delta view: Mereo BioPharma had previously reported very promising Phase II data suggesting that acumapimod is an effective treatment of AECOPD, and on the back of this, has already generated significant interest from various potential partners. However, uncertainty about the route-to-market for acumapimod had hindered negotiations; with this now better understood, we expect Mereo BioPharma to soon enter more meaningful discussions with potential partners that could result in a deal by year end. Our valuation of Mereo BioPharma is currently under review, as the company is executing the proposed business combination with NASDAQ-listed OncoMed Pharmaceuticalsin (due to complete in the coming weeks). Prior to the announced combination, we valued Mereo BioPharma at £510m, or 615p/share. Mereo BioPharma develops and commercialises innovative therapeutics addressing rare and specialty diseases. These are acquired or licensed in at clinical stages from large pharmaceutical companies. The portfolio consists of four compounds that are progressing through late clinical development. Data at AACR from two key non-small cell lung cancer (NSCLC) trials has shown that savolitinib has encouraging anti-tumour activity and an acceptable safety profile both as monotherapy in exon 14m/del NSCLC, and in combination with osimertinib in MET+ EGFR-TKI refractory NSCLC. These presentations increase our confidence in Hutchison China MediTech (Chi-Med) and partner AstraZeneca’s ability to launch savolitinib, as the first available selective c-Met inhibitor, in its respective NSCLC settings in 2021 (China: MET exon 14m/del) and 2022 (Global: in combination with osimertinib), subject to positive trial read outs and subsequent approvals. We upgrade our valuation to $35.57/ADS or £54.72/share. Source: Trinity Delta Note: Adjusted PBT excludes exceptionals, Cash includes short-term investments, Adjusted EBITDA includes equity in earnings of equity investees. TATTON B combo data shows acceptable risk-benefit profile Globally, MET+ EGFR TKI resistant NSCLC is savolitinib’s priority indication. MET amplification is a common resistance mechanism (20-30% of EGFRm NSCLC). TATTON B showed promising efficacy of the savolitinib/osimertinib combination in a heavily pre-treated population. For EGFR TKI T790M-/Met+ patients (post-gefitinib or erlotinib), the objective response rate (ORR) was 52% (24/46 partial responses) and 7.1 months duration of response (DoR). Osimertinib-resistant Met+ patients showed an 25% ORR (12/48 PRs) and median DoR of 9.7 months. Plans for further pivotal combination trials in NSCLC should be announced later in 2019. This is in addition to the ongoing SAVANNAH Phase II (c-Met+ 2L/3L EGFR/T790M refractory NSCLC), which is due to read out in 2021, and could support accelerated approval in the US. China filing for 1L exon 14m/del NSCLC on track Initial mid-trial data from the first 34 patients in the China Phase II exon 14m/del NSCLC study delivered a 39% ORR (PR in 12/31 evaluable patients), with >34 weeks median treatment duration. Enrolment of the full 50+ patients should complete in mid-H219 and subject to positive trial read out, China NDA filing is targeted for 2020. Biomarkers to identify MET-driven tumours Targeted therapies require patient selection. An AACR poster of the TATTON biomarker analysis highlighted challenges in defining MET selection criteria and assay reliability, and this combined with future clinical trials will help inform a new MET biomarker strategies. We upgrade our valuation to $35.57/ADS or £54.72/share We value Chi-Med using a DCF-based SOTP approach, which includes a clinical pipeline rNPV model, at $35.57/ADS or £54.72/share. 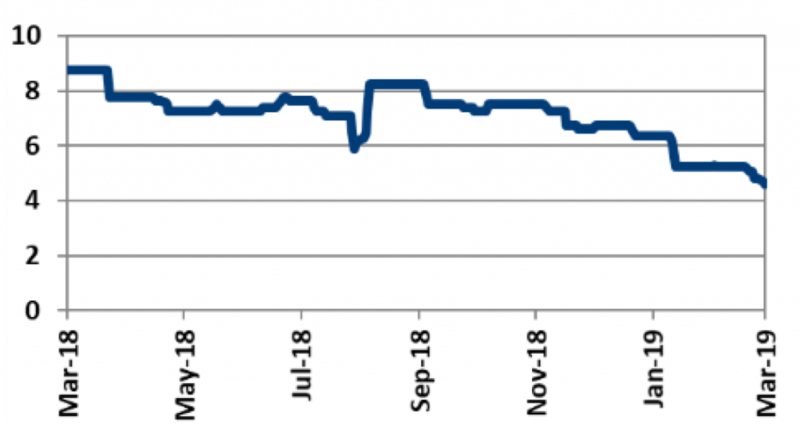 This is an increase of $2.18/ADS or £3.20/share on our previous valuation and reflects Chi-Med’s progress this year, including the recent start of the surufatinib China Phase IIb/III study in biliary tract cancer. 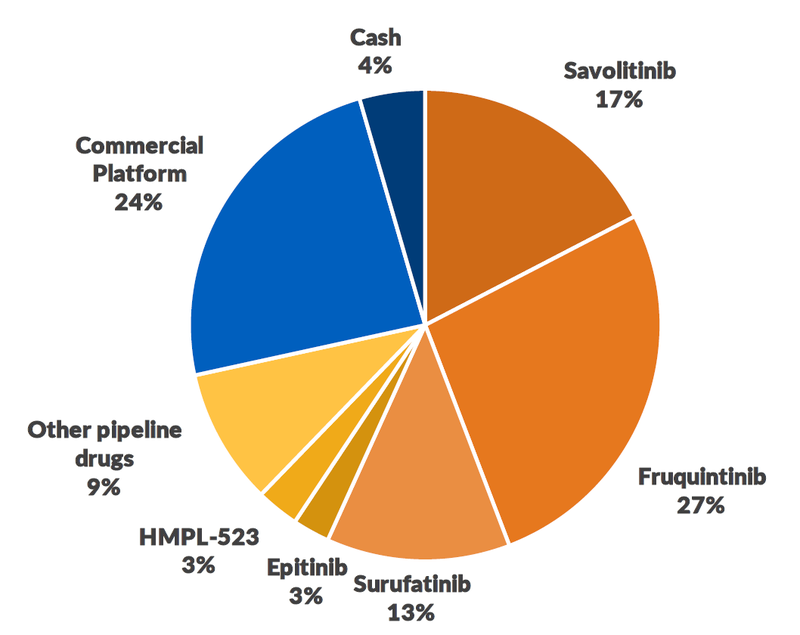 Savolitinib represents 17%: $6.18/ADS ($824m) or £9.51/share (£634m) of our valuation. Hutchison China MediTech (Chi-Med) remains on track for near-term filings of savolitinib in China and globally in non-small cell lung cancer (NSCLC). Savolitinib has the potential to be the first approved selective cMet inhibitor in its respective NSCLC settings. Data from two key trials presented at AACR increase our confidence that anticipated filing and approval time lines for savolitinib will be met. We also upgrade our Chi-Med valuation to $4.742bn ($35.57/ADS) or £3.648bn (£54.72/share), previously $4.456bn ($33.49/ADS) or £3.428bn (£51.52/share). 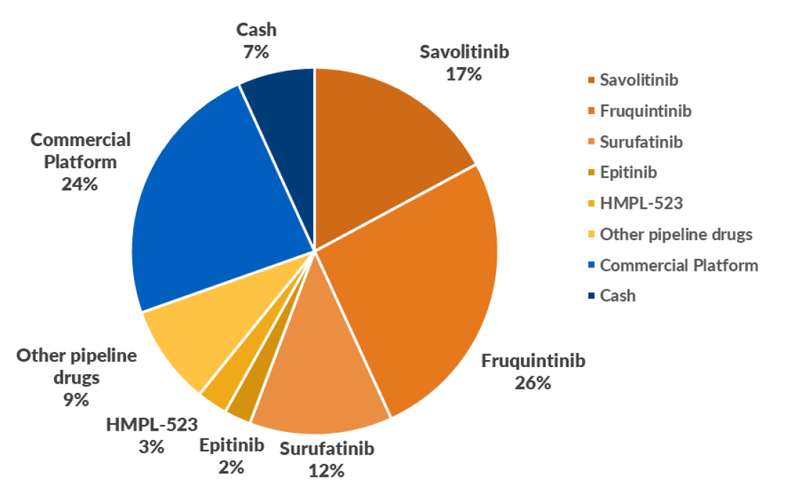 Of this, savolitinib represents 17% or $6.18/ADS ($824m) or £9.51/share (£634m). With rich news flow for 2019 and beyond, we anticipate future clinical, regulatory, and commercial catalysts will unlock further value. Initial data from the China Phase II exon 14m/del NSCLC study of savolitinib monotherapy, and mature data from the savolitinib plus osimertinib combination in the ‘B cohort’ of the global Phase Ib/II TATTON trial were presented at AACR in a plenary session entitled ‘Can the challenge of NSCLC resistance be MET or will we not MEK it?’. 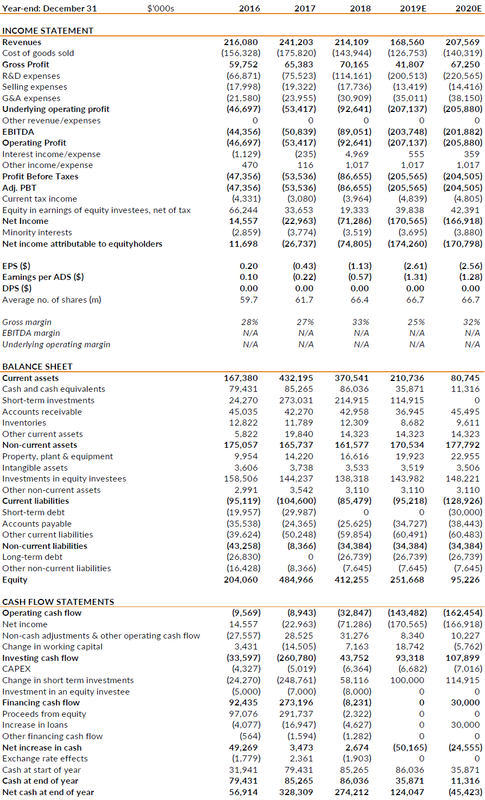 The following sections provide an overview of the data. To recap, Chi-Med and partner AstraZeneca intend to file a China NDA in 2020, assuming that data from the ongoing China >50-pt single arm Phase II study of savolitinib monotherapy in MET exon 14m/del NSCLC meets an agreed efficacy threshold. Initial data from the first 41 patients treated (31 of which were efficacy evaluable) was presented at AACR. As per the abstract, at December 2018, 12/31 patients evaluated had partial responses (39% objective response rate, ORR), with a median treatment duration of 34+ weeks. However, data presented had a later cut off (February 2019), with 16/31 PR (ORR of 51.6%), and a disease control rate of 93.5% (29/31). Outside of China, data review from the dose expansion parts of the Phase Ib/II TATTON study (TATTON B and D) coupled to the outcome of regulatory discussions will determine pivotal trial design, dosing, and target patient populations for global savolitinib + osimertinib combination studies. 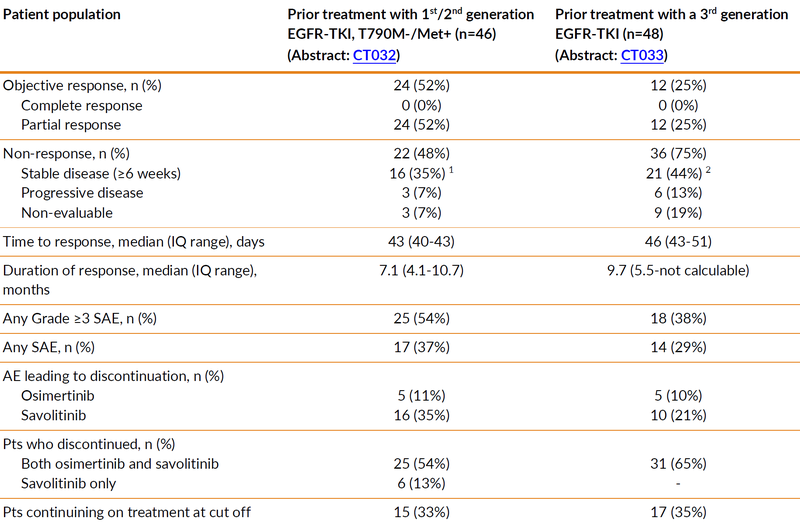 A potentially pivotal global Phase II study, SAVANNAH, evaluating savolitinib + osimertinib in c-Met+ 2L/3L EGFR/T790M refractory NSCLC is already underway, and due to read out in 2021. TATTON B data at AACR in a similar albeit not identical patient population (osimertinib approval in the 1L setting occurred after TATTON has initiated), showed a 25% ORR (12/48 partial responses) and a median duration of response of 9.7 months. Additional potentially pivotal NSCLC combination trials should be announced later in 2019. Preliminary findings from the expansion phase (TATTON B) of the open-label, multi -centre Phase Ib TATTON study demonstrated that the combination of savolitinib (600mg QD) and osimertinib (80mg QD) in patients with EGFR-mutant, MET-amplified NSCLC has an acceptable safety/tolerability profile (primary objective) with preliminary anti-tumour activity (secondary objective). TATTON B data from two distinct patient populations that had failed prior EGFR TKI therapy were presented and are summarised in Exhibits 1 and 2. This efficacy data (ORR, PR) is broadly comparable with initial TATTON B data presented at WCLC 2017 (Exhibit 3), but includes more patients and the disclosure of duration of response data for both patient groups. Source: Trinity Delta, Hutchison China MediTech. Note: Data cut off February 2018. IQ range = interquartile range. Stable disease includes: 1 4 patients and 2 5 patients with unconfirmed Partial Responses. Source: Trinity Delta, Hutchison China MediTech. Note: WCLC data only includes patients with centrally confirmed cMet status. WCLC 2017 data cut off August 2017; AACR data cut off February 2018. The primary objective of TATTON B was safety/tolerability; the data supports an acceptable risk-benefit profile in what is a late-stage and heavily pre-treated patient population. The savolitinib + osimertinib combination did generate some additive toxicity, resulting in several treatment discontinuations. In addition, one of the two deaths (due to acute kidney injury) in the T790M-/MET+ cohort was possibly treatment related, although the principal investigator stated that it was ‘difficult to evaluate’. Overall, the most frequent adverse events were nausea, vomiting, diarrhoea, and lowered leukocyte and platelet counts. We note that there is potential to manage this side-effect profile and reduce the 20-35% discontinuations due to adverse events, with a lower savolitinib dose. TATTON A, the dose-finding part of the study, established the 600mg savolitinib qd + 80mg osimertinib qd dose regime. The optimal dose may be lower. TATTON D is evaluating a meaningfully lower savolitinib dose of 300mg qd + 80mg osimertinib qd, and the Phase II SAVANNAH study has two dose levels: either savolitinib 300mg or 600mg qd in combination with 80mg osimertinib qd. Efficacy as measured by RECIST criteria was the secondary object of the study. TATTON B yielded an ITT (intent to treat) ORR of 52% (24/46) for EGFR TKI T790M-/Met+ patients (post-gefitinib or erlotinib), with an efficacy evaluable ORR of 58% (24/42), with a median DoR of 7.1 months. In osimertinib-resistant Met+ patients the ORR for the ITT population was 25% (12/48), and the ORR for the efficacy evaluable population was 28% (12/43) as 5 patients were enrolled less than 8 weeks prior to cut off, with a median DoR of 9.7 months. TATTON B data suggests that the savolitinib/osimertinib combination could offer an additional survival benefit as an effective targeted treatment option which can overcome MET-driven resistance mechanisms irrespective of prior EGFR-TKI therapy. Osimertinib was designed to provide a treatment option for EGFR T790M+ patients who have progressed after EGFR TKI therapy, but, as Exhibit 4 overleaf illustrates, c-met amplification is one of the most frequent acquired resistance mechanisms to osimertinib with 20-30% frequency (depending on whether is based analysis of circulating tumour cells or from tumour biopsy). Osimertinib was approved in the 1L setting for EGFRm NSCLC after initiation of the TATTON study, thus only a subset of patients in the TATTON B cohorts received prior 1L osimertinib and developed MET-driven resistance. Increased 1L use of osimertinib will likely increase the addressable pool of c-Met+ patients. A key challenge is developing a prospective MET biomarker strategy, with standardised MET patient selection criteria, and robust assays techniques. A poster at AACR summarising the TATTON biomarker analysis highlighted these issues, and concluded that this data could be combined with future clinical efficacy data to inform a prospective biomarker strategy to detect MET-driven EGFR-TKI resistance in NSCLC. TATTON is an exploratory study. Randomised confirmatory trials would quantify the potential benefit and support a regulatory filing; however, they may not be necessary for an accelerated approval. The first potentially registrational trial, the 172-pt SAVANNAH Phase II, initiated in December 2018 and is investigating the savolitinib/osimertinib combination in EGFRm MET+ NSCLC patients who have progressed on osimertininb. This is evaluating a similar, albeit not identical population, to one of the cohorts in the TATTON study. Data is anticipated in 2021, which may be sufficient for a filing for accelerated approval. Promising anti-tumour activity (including in brain metastases) and a tolerable side-effect profile was also confirmed by preliminary efficacy and safety data (abstract CT031) from the first 34 patients treated with savolitinib monotherapy in the China >50-pt single arm Phase II study in MET exon 14m/del NSCLC. Of the first 34 patients treated (with a 17 December 2018 cut off), 17 were treatment-naïve, 13 were 2L, and 4 had ≥2 prior regimens. 31 patients were evaluated for efficacy. Tumour responses were rapid and durable, with 12/31 confirmed partial responses (PR), a 39% objective response rate (ORR). A further 4 PRs were yet to be confirmed; including these, the ORR rises to 52%. Of the remaining patients, 10 had stable disease, 2 showed disease progression, and 3 patients were unevaluable due to early discontinuation. Median treatment duration for confirmed PR was >34 weeks (16-96+ weeks). 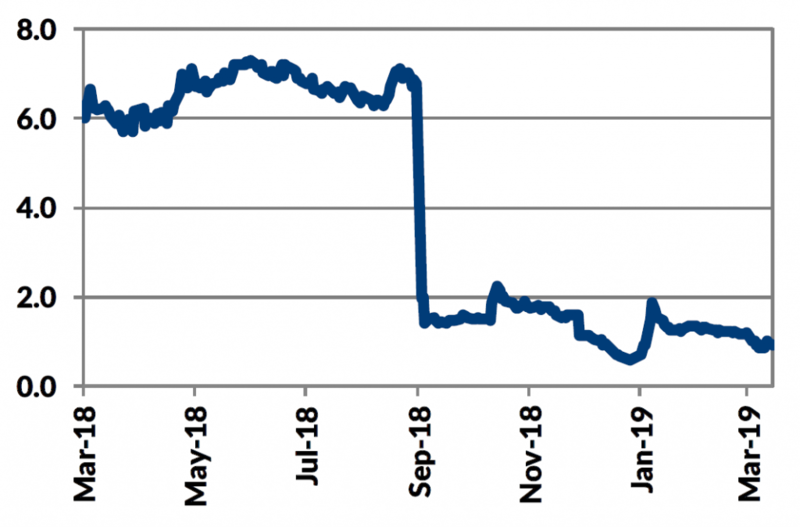 Data presented at AACR had a later cut-off of 26 February 2019. This updated information showed 16/31 PR (ORR of 51.6%), with one unconfirmed response, and a disease control rate of 93.5% (29/31). Savolitinib was generally well tolerated, with adverse events (AEs) mainly Grade 1/2, and most frequently nausea, peripheral oedema, increased liver enzymes, and vomiting. 12/34 (35%) of patients had Grade ≥3 AEs, with 5 (15%) discontinuing due to AEs, most commonly due to liver toxicity (6%). This study continues to enrol, with recruitment expected to complete in mid-H219. The primary endpoint is ORR, and should an agreed efficacy threshold be met, a China NDA will be filed in 2020 seeking accelerated approval. We value Chi-Med using a sum-of-the-parts model, incorporating an earnings-based multiple for the Commercial Platform and an rNPV analysis of the late-stage clinical pipeline for the Innovation Platform. The progress being seen across the businesses means we have raised our valuation to $4,742m (£3,638m), which is equivalent to $35.57 per ADS and £54.72 per share. For comparison, our previous valuation was $4,456m (equivalent to $33.49 per ADS) or £3,428m (£51.52 per share). Exhibit 5 shows an overview of the relative importance of the various assets to the valuation; a description of our valuation methodology and a detailed breakdown its components can be found in our February 2019 initiation. Our valuation is split between the Innovation Platform, which contributes $3,394m or £2,610m, and the Commercial Platform, which adds $1,134m or £872m. It is worth stressing that we employ conservative assumptions throughout our modelling; hence any number of incremental improvements on our base case scenarios (notably with the Innovation Platform) could result in sizeable uplifts in our valuation. It is also worth noting that this is a current valuation, based on the situation as we see it now, and not a price target for some time in the future. 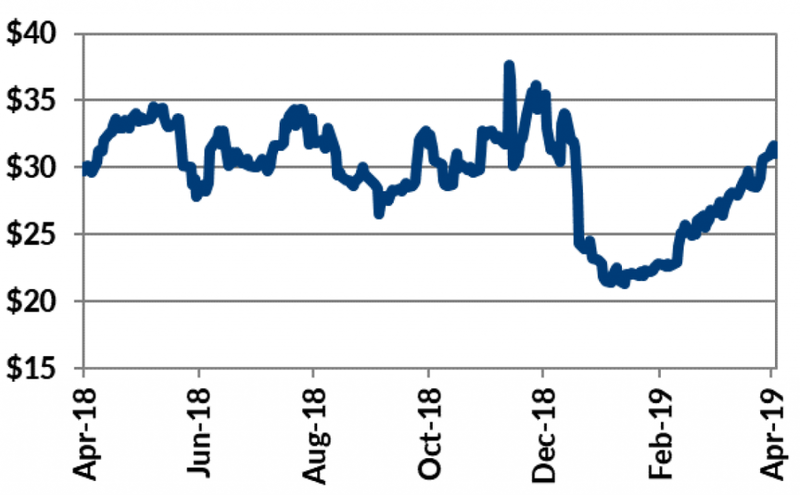 Often such price targets are expectations of what the share price should be, typically, in 12 months’ time as various value inflection points are achieved. Such price targets run counter to our conservative approach; we strive to ensure our risk-adjusted models capture the various possible scenarios, relative to both upside and downside, and then we will update our valuations as the key points are reached. Although resulting in less dramatic upside potential, we believe our valuations are more realistic, attainable and, ultimately, credible. In the Phase II trial in AML with bemcentinib in combination with low-dose cytarabine (LDAC), the pre-specified efficacy endpoint has been met; at least three patients out of the first 14 patients (21%) were required to achieve a clinical response. Of the 15 patients enrolled, 10 patients were evaluable for response to date with 4 newly diagnosed and 6 relapsed/refractory (R/R) patients. Among the newly diagnosed patients, there was one complete remission (CR) and one CR with incomplete haematologic recovery (CRi) observed; and among the R/R there was one CR observed. So, overall 3 of the 10 evaluable patients (CR/CRi rate of 30%) have achieved a clinical response. The responses had an early onset (after 1-2 cycles), were durable, and deepened over time. The combination treatment was well tolerated with no overlapping or new toxicities observed; all responders were over the age of 75 and included patients with poor risk prognosis. More detailed results from the trial, including biomarker data, will be presented at upcoming medical conferences. BerGenBio expects to start a late-stage bemcentinib monoterhapy trial in R/R AML patients in H219. Trinity Delta view: BerGenBio has already reported promising bemcentinib monotherapy data from this Phase II trial (CR/CRi/CRp rate of 22% from all 27 patients treated and 43% from the 14 patients with low levels of the sAxl biomarker, see Outlook note from January 2019). This data suggests that bemcentinib can also increase the activity of LDAC, the current standard of care for elderly AML patients and that has an ORR of only c18%. Our valuation of BerGenBio is NOK3,143m ($370m) or NOK57.45/share and data from the Phase II study in NSCLC with pembrolizumab due in the coming months could be important share price catalysts. The overall survival data from the first stage of the Phase II study in NSCLC with pembrolizumab and initial results from the trial’s second stage are due in Q219. BerGenBio is a clinical-stage, drug development company based in Bergen, Norway and Oxford, UK. It is developing innovative anti-cancer therapies that act on the promising Axl signalling pathway. The lead oncology compound, bemcentinib, is in a number of Phase II trials. Three posters on BerGenBio’s selective Axl inhibitor bemcentinib were presented at AACR, with data from preclinical studies on non-small cell lung cancer (NSCLC) and pancreatic cancer cells. The first poster showed that bemcentinib was able to enhance lymphocyte-mediated cytotoxicity of NSCLC, and it provided details of how tumour resistance to cytotoxic T-lymphocytes (CTL) and Natural Killer (NK) is mediated by a novel Axl mechanism. The second poster presented data indicating that Axl plays a key role in mediating tumour plasticity and progression, metastasis, and resistance to gemcitabine in pancreatic models. The third poster suggests that bemcentinib could act synergistically with DNA-Damage Repair (DDR) inhibitors. Specifically, in a NSCLC model, bemcentinib induced in a dose-dependent manner activation of checkpoints, thereby arresting cell proliferation. It was also found that bemcentinib acted synergistically with DDR targeting compounds, VX-970 and AZD6738 (ATR inhibitors). BerGenBio is currently preparing for late stage studies in NSCLC in combination with a PD1/PD-L1 inhibitor having reported very promising data from the first stage of a Phase II study in NSCLC in combination with pembrolizumab (see Outlook note in January 2019) and several immuno-oncology combination trials are ongoing in additional indications. There is also an investigator-led study in pancreatic cancer in combincation with chemotherapy being conducted by University of Texas Southwestern Medical Center, US. Trinity Delta view: These new data lend further support to the broad potential of bemcentinib in different settings and its proposed mode of action in reversing immune suppression and therapy resistance. The results from the preclinical studies with NSCLC models provide further scientific rationale for combining bemcentinib with PD1/PD-L1 inhibitors, as well as opening-up a potential new setting for bemcentinib in combination with DDR agents. Similarly, the data from the pancreatic cancer studies lend support to the use of bemcentinib in this indication. Our valuation of BerGenBio is NOK3,143m ($370m) or NOK57.45/share. The next significant catalysts for the shares are expected to be overall survival data from the first stage of the Phase II study in NSCLC with pembrolizumab and the results from the trial’s second stage, both of which should be reported in Q219. Nexstim aims to raise c €5.2m through a pre-emptive rights issue and could raise a further €2.6m from attached warrants. Shareholders have the right to subscribe for 14 shares for each share currently held; the subscription price of the new shares is €0.115. In addition, one offer warrant will be issued free of charge for every two new shares purchased. The subscription period begins on 2 April and ends on 26 April in Finland and on 24 April in Sweden. 6% of the rights issue is underwritten, meaning that Nexstim will raise funds of at least €1.1m. If the rights issue is taken up in full, the company expects to raise €4.8m after costs. Proceeds will be used to develop Nexstim’s sales and marketing capabilities (especially in the US), finance the purchase of NBT systems, repay existing loans (€1m is repayable to Kreos in 2019), finance R&D and working capital needs, as well as for general corporate purposes. Trinity Delta view: The value of Nexstim’s proprietary NBT platform is increasingly becoming visible. Whilst the first commercial delivery in the US for the depression indication is a useful milestone, the real value of the platform lies in the stroke rehabilitation indication. The major inflection point is rapidly approaching, with the results of the important E-FIT trial expected within circa three weeks. Assuming a positive outcome, the next stage will be to raise sufficient cash to implement a comprehensive commercialisation strategy and to progress the proposed clinical trial programme. It should be remembered that Nexstim has significant opportunities ahead, if it is able to overcome its financial difficulties. In particular, transcranial magnetic stimulation is increasingly being recognised as a therapy for c 6m MDD patients, and NBT is the only system that can deliver accurate and reproducible treatment. Nexstim has also recently had a rapid treatment protocol approved by the FDA, reducing treatment time to 3 minutes vs 37 minutes currently, which should make the NBT system more competitive. Prior to the announcement of the rights issue we valued Nexstim at €10.5m or €3.23/share; we will be reviewing our valuation once the results of the capital raise are reported. Nexstim is a targeted neuro-modulation company that has developed a proprietary navigated rTMS platform for use in diagnostics (NBS) and therapeutics (NBT). NBS is used in planning brain surgery while NBT is focused on depression and chronic pain. FDA approval for depression was given in 2017, and the focus is on its commercial roll out in the US, Europe and Asia. Hutchison China MediTech’s (Chi-Med’s) noteworthy achievements in FY18 include the landmark approval and launch of Elunate (fruquintinib) in China in 3L mCRC; the continued maturation of the tyrosine kinase inhibitor (TKI) pipeline with multiple assets either in, or approaching, China or Global registrational trials; and significant investment in building the US infrastructure to support the Global Innovation pipeline. 2019 should bring further progress, with a steady stream of clinical catalysts. 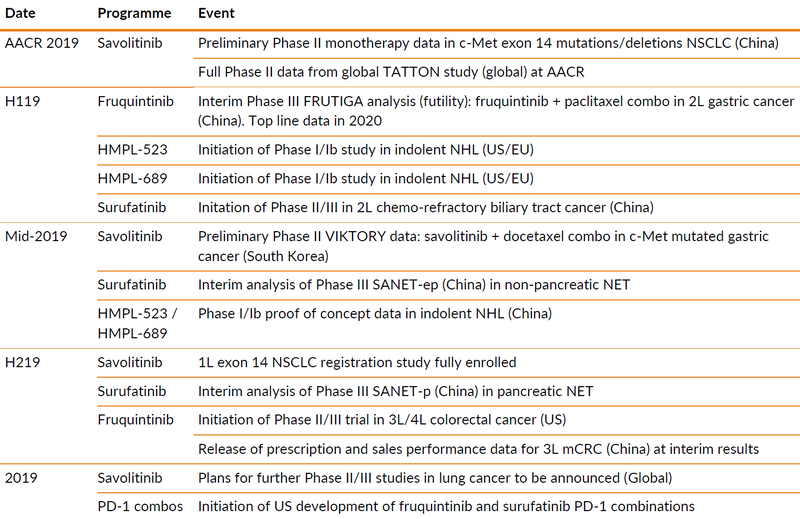 Next up will be savolitinib NSCLC data at AACR (March 29-April 3). We continue to value Chi-Med at $33.49/ADS or £51.52/share. Elunate (fruquintinib), a pioneering product Elunate was launched with partner Eli Lilly in November, generating revenue of $3.6m in its first five weeks. Solid early signs of clinical acceptance should be boosted by confirmation of reimbursement; negotiations to secure potential National Drug Reimbursement List (NDRL) inclusion in the 2019 update will be pursued. On the development front, the Phase III FRUTIGA gastric cancer interim analysis is imminent, and PD-1/PD-L1 combination studies are planned. The December Eli Lilly deal amendment provides Chi-Med with greater control over R&D plans (including life cycle initiatives), increasing the potential Elunate market opportunity, and its share of deal economics. Savolitinib to take centre stage for Chi-Med at AACR Mature data from the Phase Ib/II global TATTON savolitinib and osimertinib combination NSCLC trial are scheduled for presentation at AACR on March 31, in a plenary session that also includes interim data from the China registration study of savolitinib monotherapy in exon 14m/del NSCLC. This latter study should complete enrolment in H219 and, subject to a positive result, will enable China NDA filing in 2020. Outside of China, the SAVANNAH Phase II savolitinib and osimertinib combination trial in c-Met+ 2L EGFR/T790M refractory NSCLC is due to read out in 2021 and further potentially pivotal NSCLC combination trials should be announced later in 2019. R&D investment to grow with portfolio progress FY18 results met or exceeded expectations. FY19 guidance is centred on R&D spend ($160m to $200m) and adjusted non-GAAP net cash flows (-$120m to -$150m). This reflects growing investment in the Innovation Pipeline, which is the driver of Chi-Med’s future growth, initially through addressing the China Oncology opportunity and longer-term through the Global Innovation pipeline. We maintain our $33.49/ADS or £51.52/share valuation We value Chi-Med using a DCF-based SOTP approach, which includes an rNPV model of the clinical pipeline. Our current valuation of $4.5bn ($33.49/ADS) or £3.4bn (£51.52/share) will be influenced by various share price catalysts over the next 18 months. 2018 marked several important achievements for Hutchison China MediTech (Chi-Med), and 2019 will be another critical year for the company with a rich vein of news flow (Exhibit 1). Several clinical studies are due to produce both interim and mature results, and various new trials will initiate, including global proof of concept studies for Syk inhibitor HMPL-523 and PI3Kδ inhibitor HMPL-689. However, the focus for investors will largely be on Chi-Med’s two most valuable assets – fruquintinib (Elunate) and savolitinib – and on the burgeoning US infrastructure and Global Innovation pipeline. We continue to value Chi-Med at $4.5bn ($33.49/ADS) or £3.4bn (£51.52/share) but expect to revisit our assumptions as clinical, regulatory, and commercial catalysts unlock further value. Elunate (fruquintinib) was the first domestically discovered and developed innovative oncology compound approved in China. Following launch in 3L mCRC last November, Elunate is showing solid early signs of clinical acceptance. In the first five weeks on the market, it generated revenue of $3.6m for Chi-Med, broken down as $3.3m from product purchases (manufacturing) and royalties of $0.3m (15% of c$2m in end-user sales) from partner EIi Lilly. Management also confirmed that by end-January (ie the first nine weeks on market), over 1,000 patients had received Elunate therapy. Elunate is currently an out-of-pocket drug, priced at RMB 21,960 per 4-week cycle (equivalent to US$3,300), although a domestic Patient Access Programme (PAP) essentially limits the pateint’s cost of treatment to a maximum of three cycles. The PAP is designed to ensure broad availability while reimbursement discussions are ongoing. Eli Lilly and Chi-Med have focused on ensuring patient access to increase penetration into the 3L mCRC setting, and drive sales through volume rather than solely price. Negotiations to secure National Drug Reimbursement List (NDRL) inclusion in a potential 2019 update will be pursued. We believe there is strong potential for Elunate’s future inclusion on the NDRL given the precedent set by the listing of domestically developed drugs such as apatinib (in gastric cancer) and anlotinib (in NSCLC). On the development front, an interim analysis for futility for the Phase III FRUTIGA trial in 2L gastric cancer is imminent, and PD-1/PD-L1 combination studies are planned as part of the first wave of life cycle indications (LCIs). Chi-Med’s pursuit of LCI development is facilitated by the amendment to the Eli Lilly collaboration announced in December. This amendment provides Chi-Med with greater control over China R&D plans (including LCIs) in exchange for assuming R&D funding. Amended terms are shown in Exhibit 2. Source: Hutchison China MediTech Note: 1 = Per LCI in China, up to 3 LCIs; 2 = Based on total Elunate sales in China, triggered by first LCI launch; 3 = Not expected before 2021 as it will be triggered by China launch of Eli Lilly’s anti-VEGF mAb Cyramza (ramucirumab). Fruquintinib is a core asset in both China Oncology and Global Innovation. The deal amendment expands the potential Elunate market opportunity in China, which coupled to potential co-promotion rights (from 2021+), significantly improves Chi-Med’s share of deal economics. It also leverages Chi-Med’s commercial acumen and provides a cornerstone product for the nascent Oncology Commercial organisation (currently c30-strong but expanding to 200 by end-2021). Fruquintinib is also one of five Global Innovation clinical assets, which, excepting savolitinib (partnered with AstraZeneca), will be sold through the global marketing organisation. Elunate is currently Chi-Med’s most valuable China asset, contributing $8.51/ADS ($1,132m) or £13.09/share (£871m) to our Chi-Med valuation. Savolitinib development has been prioritised in non-small cell lung cancer (NSCLC) by Chi-Med and partner AstraZeneca. Data from two key NSCLC trials will be presented at AACR. These trials are critical in determining the potential for accelerated launch in China (as monotherapy in 1L MET exon 14m/del NSCLC), and the global development timeline and positioning of the savolitinib/osimertinib combination in EGFR/T790M refractory NSCLC. Read out of the complete data set from the China 92-pt single arm Phase II study in MET exon 14m/del NSCLC will establish potential for accelerated approval of savolitinib monotherapy in this indication. Enrolment is on track to complete in H219, data read out is expected in 2020. Should an agreed efficacy threshold be met, an NDA could be filed in 2020 with potential for China approval in 2021. Data review from the dose expansion parts of the Phase Ib/II TATTON study (TATTON B and D) coupled to the outcome of regulatory discussions will determine pivotal trial design and dosing for global savolitinib + osimertinib combination studies. SAVANNAH, a global Phase II study evaluating savolitinib + osimertinib in c-Met+ 2L EGFR/T790M refractory NSCLC, which could enable US approval, was initiated in December 2018 and should read out in 2021. However, Chi-Med/AstraZeneca have indicated that they anticipate announcing plans for further potentially pivotal combination trials later this year. This strategy of running two global trials in parallel in two NSCLC target patient populations with breakthrough therapy designation (BTD) potential should increase the probability that the combination reaches the market rapidly. We believe savolitinib could receive FDA approval in combination with osimertinib by 2022, if not earlier. TATTON Phase Ib expansion cohort: Osimertinib plus savolitinib for patients with EGFR-mutant, MET-amplified NSCLC after progression on prior third-generation EGFR TKI (CT033). In addition, a biomarker analysis of the TATTON study will be presented in a poster on April 3: Detection of MET-mediated EGFR tyrosine kinase inhibitor (TKI) resistance in advanced non-small cell lung cancer (NSCLC): biomarker analysis of the TATTON study (4897/20). We currently value savolitinib at $5.61/ADS ($746m) or £8.63/share (£574m). We value Chi-Med using a sum-of-the-parts methodology, incorporating an earnings-based multiple for the Commercial Platform and an rNPV model for the Innovation Platform. Our valuation remains $4,456m (equivalent to $33.49 per ADS) or £3,428m (£51.52 per share). Exhibit 3 provides a high-level overview of the relative importance of the various assets to the valuation; a detailed breakdown of our valuation can be found in our February 2019 initiation. Our valuation is broadly split between the Innovation Platform which contributes $3,029m or £2,330m, and the Commercial Platform which adds $1,131m or £870m. We employ conservative assumptions throughout our modelling; therefore, any number of incremental improvements on our base case scenarios (notably within the Innovation Platform) could result in sizeable uplifts in our valuation. Additionally, visibility on the late-stage clinical programmes is increasing, with a rich news flow over the coming years. This suggests that there is significant upside potential, with multiple catalysts expected over the coming 24 months. Chi-Med reported FY18 results that met or beat expectations. Group revenues were $214.1m, down 11.2% (FY17: $241.2m) due to the implementation of the ‘two-invoice’ accounting/booking system which altered how domestic China sales are reported. Revenue growth at the JVs of 13.4% to $491.5m (from $433.3m) provides a better reflection of the Commercial Platform’s performance. R&D spend in the Innovation Platform of $142.2m, up 61.6% from $88.0m, rose in line with the increasing number of later-stage clinical studies that are underway. This translated into an attributable net loss rising at the Group level to $74.8m, against $26.7m last year. Cash resources remained strong, with $420.3m available at December 2018, vs $479.6m at end-2017. This consists of cash, cash equivalents, and short-term investment of $301m, and unutilised bank facilities of $119m. An additional $42m in available cash resources is held within the non-consolidated JVs. Management are confident this should support the increased spending in R&D through to at least 2020. We believe, given the clinical opportunities, that it would be judicious to issue some additional debt (c $30m in FY20 in our modelling), in the absence of an additional capital raise. Debt financing for Chi-Med could be an attractive option for the company, given the strength of its commercial operations, broad pipeline and backing (implicit and explicit) from CK Hutchison. For FY19, Chi-Med has streamlined its financial guidance, focusing on the most important guidance metrics: R&D investment and adjusted Group net cash flows. 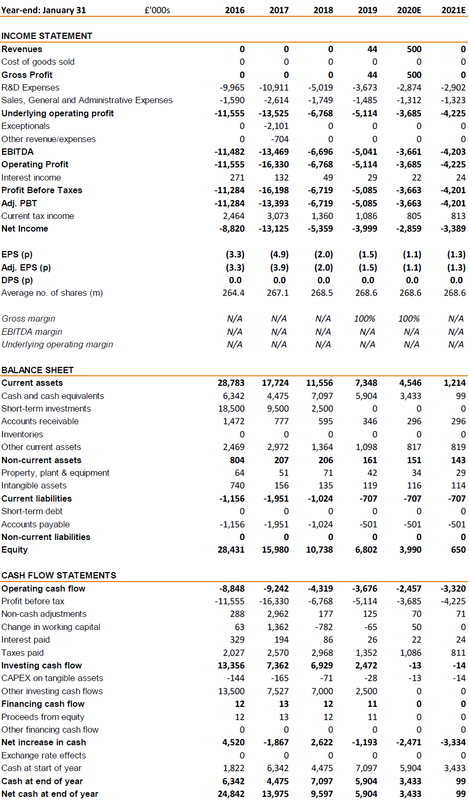 Adjusted net cash outflows (non-GAAP), excluding any financing activity, are anticipated to be between $120m-$150m. We estimate that Chi-Med will be investing $200.5m and $220.6m in R&D in FY19 and FY20, respectively. to support the growing number of pivotal studies and increased investment in Global Innovation. We have revised our estimates as indicated in Exhibit 4, to take into account the FY18 results and management guidance; and our financial forecasts are shown in Exhibit 5 overleaf. Gaining traction but financing tight FY18 results saw revenues flat at €2.7m, but sustained cost control resulted in the net loss reducing from €7.3m to €6.2m. Cash outflow was €6.2m, vs an outflow of €5.4m in FY17, largely reflecting investment in the commercial infrastructure. The cash position at December was €7.2m, against €8.5m the previous year; this includes the €4.0m loan from Kreos Capital. Projected cash burn suggests a funding requirement of around €6m, through equity issuance and possibly asset sales, to execute the commercial plans. Developing the MDD opportunity NBT’s use in Major Depressive Disorder (MDD) is set to be the revenue driver over the medium term. The focus is on raising market awareness of the platform’s value, notably the compelling patient outcomes and economic benefit to clinicians. Management has initiated commercial plans, making investment in marketing infrastructure, technology, and process improvements. Gaining traction in the key US market will be the major determinant of success. Rights issue and possible sale of diagnostic unit Management’s priority is to secure the funding required to commercialise effectively NBT’s MDD indication. The proposed rights issue may be augmented by the divestment of the NBS pre-surgical mapping unit, but we have not factored this into our expectations. The clinical evidence supporting NBT’s use in MDD is convincing. Transcranial magnetic stimulation is increasingly being recognised as a therapy for c 6m MDD patients, and NBT is the only system that can deliver accurate and reproducible treatment. Valuation updated to reflect financial risk We have updated our DCF model for FY18 results and the financial risks now present. This values Nexstim at €10.5m or €3.23/share currently and diluted (in the money options only). 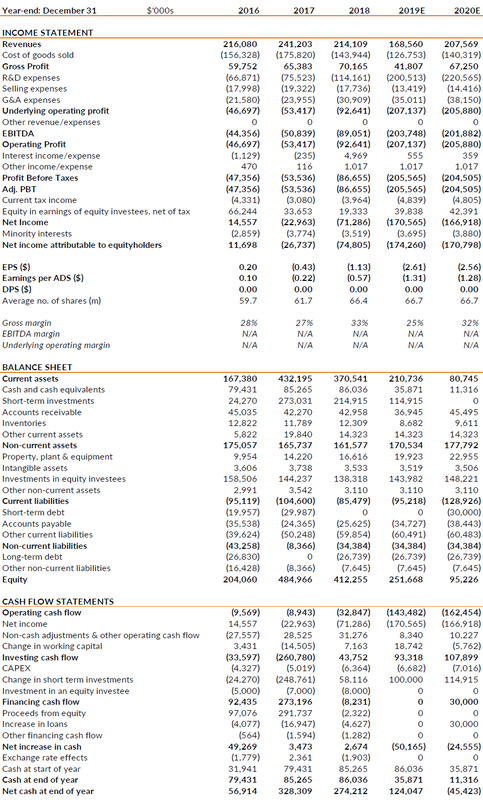 This compares to €35.9m or €11.04/share and €10.30/share diluted previously. Nexstim’s management is seeking to secure a solid financial foundation for its commercial future. Following last year’s disappointing result in the pivotal E-FIT Phase III stroke trial, the strategy was re-focussed on maximising the market potential of its highly accurate TMS (Transcranial Magnetic Stimulation) system as a treatment for major depressive disease (MDD). The recent publication of FY18 results showed that revenues were €2.672m, vs €2.645m in FY17 and our forecast of €2.934m. Good cost control saw the net loss fall to €6.154m, from €7.328m the prior year and beat our expected €6.487m. The loss per share was €1.93 from €2.77, and similarly better than our forecast €2.03. The operating cash flows showed an outflow of €6.193m as a result of the residual R&D spend of the stroke programme, coupled with continuing investment in expanding the sales and marketing infrastructure. The outflow in FY17 was €5.403m, and our FY18 forecast was €7.122m. The cash position at December 2018 was €7.175m, against €8.474m the previous year; this includes the €4.0m loan from Kreos Capital. Management estimates it will require a minimum of €3m to maintain its going concern basis (sufficient through to December 2019) if the terms of the Kreos loan agreement are maintained. The amount required would rise to around €6m, including outstanding interest and fees, if Kreos were enabled to call the loan in prematurely. Management’s priority is to strengthen its financial position and is evaluating options that include equity funding and the divestment of non-core assets. We detailed Nexstim’s proprietary TMS technology and its clinical applications in previous notes (notably our comprehensive Initiation July 2018), with an extensive note examining its use in depression and its commercial prospects (Update October 2018). To recap briefly, the platform is currently employed in two related albeit commercially separate divisions: Diagnostics and Therapeutics (Exhibit 1). The diagnostics division comprises the Navigated Brain Stimulation (NBS) system which is used, and extensively validated, in pre-surgical brain mapping, while the Navigated Brain Therapy (NBT) system has been optimised for therapeutic use. NBS is principally used as a diagnostic tool in pre-surgical mapping (PSM), where it provides greater mapping precision, allowing surgeons to be more aggressive in tumour resection, thus improving treatment outcomes. The NBS system was launched in 2003 and has subsequently developed an impressive, and supportive, client list. The global installed base is around 160 NBS systems, including numerous world-renowned cancer centres (for instance: Mayo Clinic, Karolinska, MD Anderson, Charité, Great Ormond Street Hospital, and UCSF). Management’s stated strategy is to focus on the NBT clinical applications and is considering viable options for the NBS unit, including its divestment through a partnership or trade sale, although the details have yet to be made public. The suggestion is that the available options will be discussed at the AGM, scheduled for March 25. As yet, management has not indicated what the likely divestment value will be. We value the NBS unit, using a risk-adjusted DCF model, at €6.2m. This figure does not include the specific direct and indirect costs, particularly regulatory and field support and R&D efforts, as these were allocated across the whole company. Allowing for these, and to reflect the reduced negotiating room management has, we estimate the realisable value to be around €3m to €4m. The Navigated Brain Therapy (NBT) platform was FDA approved for MDD in December 2017 and launched in the US in May 2018. It is the only FDA approved device with built-in navigation, ensuring accurate and reproducible treatment. This is achieved through precise mapping of the motor cortex, and via proprietary e-field modelling to account for distortion caused by bone and brain tissue, accurately visualising the exact location, orientation, and magnitude of the stimulation. This means NBT can target the DLPFC (dorsolateral prefrontal cortex) 100% of the time vs 30% with other TMS approaches. Early indications are that the benefits of accurate navigation are readily understood by clinicians. The opportunity in MDD is material and timely. Treatment resistant depression (ie unresponsive to pharmacological anti-depressant medication) has a current addressable market of c 6m patients but is growing rapidly. The use of repetitive TMS (rTMS) is accepted as a second-line therapy, with the first FDA approval occurring in 2008 (Neuronetics’ Neurostar focal iron core coil TMS platform). It is also reimbursed in the US and various European countries. In the US, the commercial strategy is direct sales, with ten people currently in the sales team addressing four key geographic areas (North East states, South East states, Texas, and California) where TMS is already established and high-volume psychiatric practices appear primed. In Europe and Asia, a mixed direct and distributor model is being deployed, with the recent Ampere Medical distribution deal for Hong Kong demonstrating progress in developing new markets. The commercial priority is to raise market awareness of its NBT system. Growth in patient registry data in MDD (including a comparative element with non-navigated systems) will supplement the body of clinical outcomes evidence and should support a shift from existing treatment practices and increase adoption of NBT. Growing understanding of the value proposition (ie improved patient outcomes and economic benefit to clinicians) should be a key driver of uptake. We value NBT’s use in treating MDD, again using our risk-adjusted DCF model, at €21.5m. This is based on peak sales of €22.4m being achieved in 2028, which should be attainable through the use of a targeted sales team in the direct markets and well-motivated distributors in the other territories. Arguably this figure should be reduced to reflect the larger cost contribution this business area would carry to reflect the possible divestment of the NBS unit, but we are assuming overheads will be trimmed. In fairness, we are already employing conservative assumptions throughout (notably regarding clinical adoption), so the effect is, in any case, relatively minor. The treatment of chronic neuropathic pain is currently the largest application in the neuromodulation market. While Nexstim’s NBT is CE Marked for chronic neuropathic pain, the FDA has yet to approve any rTMS device for this indication. This largely reflects the fact that no large, multi-centre, randomised clinical trials have yet been undertaken by any manufacturer. Following encouraging results from an exploratory 39-patient Phase II study at The Walton Centre, Neuroscience Research Centre, Liverpool (detailed in our Initiation note), Nexstim was evaluating potential clinical trials for neuropathic and related chronic pain. The pressing need to finance adequately the depression opportunity suggests that, despite the clinical potential, pursuing the neuropathic pain indication will be a lesser priority. We value the pain indication at €5.4m, with peak sales of around €25.8m by 2033 and a success probability of only 25% (reflecting the early nature of the clinical studies). We should note that this indication is the one most sensitive to Nexstim’s financial position, where limited funds would, rightly in our view, be channelled towards commercialising MDD. 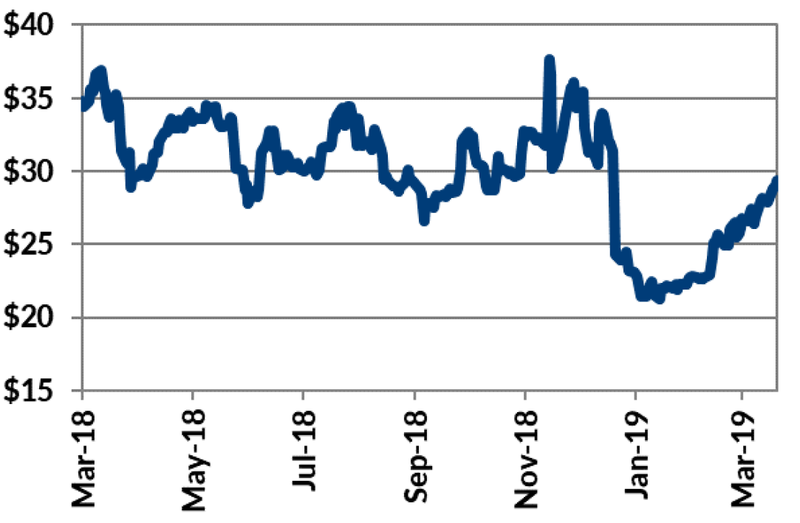 We believe a risk-adjusted DCF model is the most appropriate method to value Nexstim, and this shows that the company is undervalued at current levels. However, realistically, the single major consideration lies in ensuring sufficient financing is in place to execute the commercial plans for the MDD indication. Source: Trinity Delta; Note: Peak sales achieved after nine years in the US and 10 years in Europe. We assume the subscription prices for the 2018 options is the weighted average of existing options, which is €5.337. The financial uncertainty surrounding the company is understandable, weighs heavily on the share price, and does cloud our investment case. To reflect this, we have maintained our previous assumptions based on sufficient funding being in place to support the commercial operations adequately. However, to this clean operational scenario we have added a further risk probability to present the possibility that the necessary funds will not be available in a timely manner. In order to maintain the desired transparency in our modelling we show two valuation figures for each business unit: the first is based on the commercial outcomes we would expect if funding were not an issue; and the second introduces a risk adjustment for the current funding uncertainties. Obviously, assuming the funding picture becomes clearer, the second valuation figure should converge with the first valuation over time. NBT MDD is the largest element, with the “commercial” valuation being $21.5m, but reducing to €7.5m when we overlay our “financial risk” adjustment. The NBS diagnostic unit is valued at €6.2m and reduces to €2.2m after risk adjustment. Similarly, the NBT Pain indication is valued at €5.4m and €1.9m respectively. 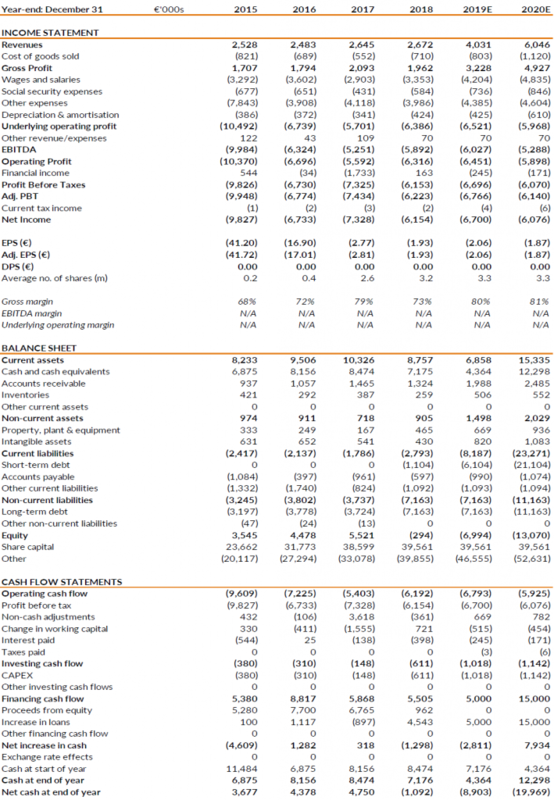 Obviously, the net cash/debt position remains at -€1.1m under both scenarios. This results in our valuation for the company being €10.5m, which is equivalent to €3.23/share and also €3.23/share diluted (based on in-the-money options and warrants). This compares to €32.0m or €10.5/share were the financial risk removed. For context, our previously published valuation was €35.9m or €11.04/share and €10.30/share diluted. It is worth highlighting that we always seek to apply conservative assumptions regarding patient populations, market sizes and growth rates, net pricing, adoption curves, and peak market penetration. Also, we only value the existing clinical assets with potential supplementary clinical indications and off-label usage excluded. Additionally, as before, we have also sought to account for the known dilution from the outstanding warrants and options. Nexstim had net cash of around €1.1m at December 2018 which, despite the cessation of clinical work on stroke and other cost cutting, means the need for funding is pressing in our view. Although still unclear, our forecasts (based on the Kreos loan facility being in place) suggest that Nexstim needs around €6m over the next 12 months to properly execute its commercialisation plans for NBT in MDD. Depending on the level of subsequent investment needed in the commercial infrastructure and the level of sales performance, further funds may be required: we model €15m in FY20. However, the actual amount and timings will depend on the rate of clinical acceptance and institutional adoption on the one hand, and the investments in clinical data and marketing effort on the other. Source: Nexstim, Trinity Delta Note: The accounts are produced according to Finnish GAAP. The short-term debt in FY19 and FY20 is indicative of our view of the company’s funding requirement. Our sales forecasts do not include any contribution from indications that are yet to be approved. Historic EPS, DPS and Average no. of shares have been adjusted to reflect the 30:1 share consolidation in December 2018. Chi-Med reported FY18 results that met or beat expectations. Group revenues were $214.1m, down from $241.2m as the two-invoice impacted how domestic China sales are reported, with the JV revenues growth of 13.4% to $491.5m (from $433.3m) being a better reflection of the Commercial Platform’s performance. R&D spend in the Innovation Platform was $142.2m, up from $88.0m, as more later-stage clinical studies are undertaken. This sees the Group’s attributable net loss rising to $74.8m, against $26.7m last year. Cash resources remained strong, with $420.3m available at December 2018, versus $479.6m in 2017. It is the Innovation Platform that is driving future growth, initially through addressing the China Oncology opportunity and further out Global Innovation. Elunate (fruquintinib) was the first domestically discovered and developed innovative compound approved in China. It was launched, together with Eli Lilly, in November and is showing solid early signs of clinical acceptance. The collaboration has been amended, with Chi-Med funding more clinical work in return for greater marketing freedom and better financials; this is likely to enact in 2021/2 in our opinion. Five products are currently in clinical trials aimed at Global markets, with clinical and regulatory teams being bolstered in the US and Europe. Four of these (fruquintinib, surufatinib, HMPL-523, and HMPL-689) are not partnered and will form the basis of the longer term global marketing infrastructure. Savolitinib is partnered with AstraZeneca and is on track to be approved in combination with Tagrisso by 2022, if not earlier, in our view. Management’s target is to progress one novel drug candidate into global development per annum. 2019 is expected to see a wealth of news flow as a number of clinical studies produce both interim and mature results. The first of these is likely to be two presentations at the AACR meeting in 29 March-3 April, with the Phase II data of the savolitinib single agent NSCLC Exon 14 deletion study and the Phase Ib results for the savolitinib/Tagrisso combination in NSCLC (the TATTON study) scheduled. A further dozen trial results are likely to be presented at various conferences during the year. e-therapeutics ended its FY19 (year-ending 31 January 2019) on a high, securing its first commercial collaboration with Novo Nordisk in December (see Update note). Business development and cost control were the focus areas for FY19. The Novo deal in Type 2 diabetes marked a first success on the former, providing important validation for e-therapeutics’ proprietary Network-Driven Drug Discovery (NDD) platform. Prudent cost management means end-FY19 cash of £5.9m, coupled with an anticipated £1.1m tax credit, provides a two-year runway on our estimates. The goal is to now capitalise on ongoing, and new, business development discussions covering the full range of e-therapeutics’ assets and capabilities, to help progress NDD-derived projects and further exploit the NDD platform. Our valuation is £57.8m (21.9p/share). Many irons in the business development fire The breadth of e-therapeutics’ assets and NDD capabilities means that active business development interactions are ongoing with multiple potential partners. The Novo deal is an exemplar of the application of the NDD platform in the potential discovery of novel biological mechanisms and therapeutic approaches for a specific complex disease area. Further collaborations of this type are sought; other possible transactions under consideration range from cost-sharing deals for internal NDD-derived assets (Tryptophan Catabolism and Immune Checkpoint Modulation) to M&A. GAIN-ing new opportunities Ongoing investment in core technology has generated potentially powerful innovative network-related tools. A prime example is GAINs (Genome-Associated Interaction Networks), which emerged from insights gleaned from work associated with the C4X Discovery Parkinson’s disease collaboration. GAINs can interrogate genomic data and link this to an underlying disease mechanism and phenotype – a key challenge in AI approaches to drug discovery. We anticipate e-therapeutics will begin marketing this tool imminently and expect it to be of interest to many large pharma companies. Careful cost control continues FY19 results marked the third year of narrowing half-year losses. FY20 guidance is for a more modest reduction in operating loss. End-January 2019 cash of £5.9m, plus a £1.1m tax credit, provides funding through Extension of the Novo deal beyond the initial 12-month period, potential payments from new partners/cost-sharing deals, or M&A could extend this further. Valuation maintained at £57.8m (21.9p/share) We have broadly maintained our forecasts based on commendable cost control and spending priorities, which results in no changes to our underlying valuation assumptions. Upside would come from progression of the Novo Nordisk diabetes collaboration into a licensing agreement, and from new deals with large pharma or other partners.